With the winter holidays fast approaching many of us will find ourselves doing extra shopping, both in department stores and malls, and also in food stores. For obvious reasons, a lot of fall down accidents occur in supermarkets. 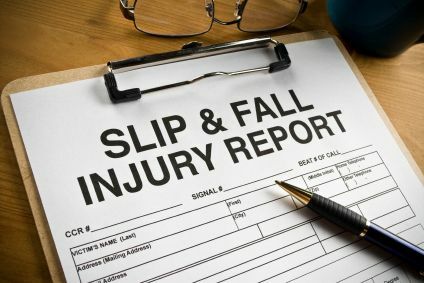 The White Plains accident attorneys at Worby Groner Edelman are experienced in representing victims of fall down accidents. Call us if you or a family member have been involved in this type of accident. A fall down accident can occur in as little as two or three seconds. You might be walking in a natural manner and very suddenly find yourself on the ground or floor, and very often in significant pain, and shocked by what just occurred. Still, it’s crucial that you take a moment to view your surroundings, and be familiar with the condition that caused you to fall. Who is Responsible For Your Fall? The truth is that a store owner, or any property owner, is not a guarantor of your safety, and the fact that you fall on someone else’s property does not automatically mean that they are responsible for your fall. The law requires that a victim of a fall-down accident prove that the owner of the property knew of the dangerous condition that caused you to fall, or, in the alternative, that the dangerous condition existed for a sufficient length of time that they should have known of the condition. If, for example, you were to fall on a slippery substance in a food store, take a minute to look at the condition. Does it look dirty, or is there dirt or dust in that slippery substance? If there is, that might be an indication that the substance was on the floor for a long enough period of time that the store should have had sufficient time to clean that floor. Is there any other customer in the area that told you that they saw the floor in that condition for a period of time prior to your accident? Try and get their names and contact information, because that person can help us prove a case later on. Take a minute to make a mental note of what caused you to fall, because as a party bringing a lawsuit, you have to be able to answer questions about the cause of your accident. Use your cell phone to photograph the condition, and what it looked like at the time of your fall. Try and take several photographs from different angles. Make sure that you report the accident to a store manager, and ask that manager to take a written report. It’s best to do so immediately at the time of the accident, but if you’re too injured to do this at the time of the accident, try to return to the store the day after to report the accident at that time. Make sure that the information that winds up on the report is the information that you actually provided to the manager, and not the information that the manager just decided to write down. It goes without saying that we all have to be careful, but accidents happen. You can help yourself, and help us help you by taking note of the scene of an accident, what it was that caused you to fall, and why you fell as you did. If you’ve been injured in a fall down accident, call us. Our White Plains accident attorneys have over one hundred years of experience in this type of case. We’ll answer all of your questions, help you work through the insurance process, and do everything to help protect your rights. If a lawsuit is necessary, we’ll handle the litigation process quickly and efficiently. There is no obligation, and never a fee unless we are successful.